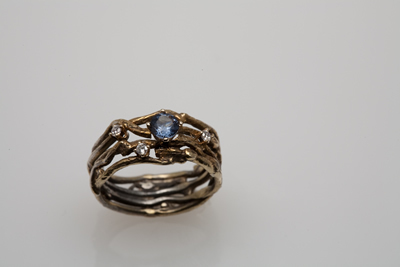 The Modern Blue Topaz Eco-ring is handcrafted with recycled 18K gold. 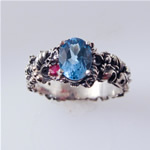 It features a round london blue, blue topaz as its center stone, accented by conflict-free diamonds. 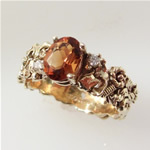 Artist worked in the jewelry industry for over 30 years. A native of Medell�n, Colombia with talent and expertise in nearly all facets of jewelry making: designing, casting, repurposing, repairing, welding, filigree, gem restoration and appraisal and as a metalsmith. Creating jewelry that melds traditional elegance with the eclectic future. Typically working with precious and semi-precious metals and gemstones, but didn�t encounter a material he couldn�t weld, meld or twist into a fabulous accessory. Jewelry pieces are distinguished by their painstakingly intricate wire-patterns, crafted using a technique known in jewelry-making as filigree. The artist designs feature unique gemstone combinations and bring together old-world, high-quality craftsmanship, with modern colors, angles and shapes. All of the designs are original and handcrafted and made using recycled metals and conflict-free gemstones.